New York pop duo Savoir Adore return with an album that is rich with pop gems, but far outstays its welcome at almost 60 minutes. Here's a theory – pop albums are like parties, in that their success depends on their not going on for too long. Linger too late at even the best get-togethers and you can hit the tipping point where the atmosphere dies; similarly, an album can put a great deal of hard-won excitement in jeopardy by outstaying its welcome and running out of steam. 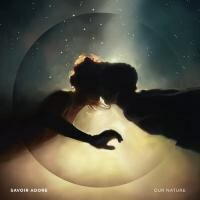 So it is with Savoir Adore's second LP Our Nature, being released now on Nettwerk after being put out independently last October. The Brooklyn duo have refined their sound into a bolder, brighter kind of electro-meets-guitar pop, and have quality tunes and especially choruses at their disposal – but the album's almost sixty minute runtime turns its second half into one long comedown. The excess of songs and ideas is probably best explained by Savoir Adore's history up to now, which saw them take a reasonably long break after their debut. They are a band that apparently formed quite accidentally, when disaffected solo artists Deidre Muro and Paul Hammer convened to some backwoods setting to record an EP in 48 hours "for a dare". Their collaboration blossomed into that debut, 2009's impressive Into the Wooded Forest (is there another kind of forest?) which came to notice mainly for catchy, danceable tracks like "We Talk Like Machines" and "Bodies" but which still retained a kind of DIY sensibility. Following that the band largely went dark, a time purportedly spent "finding inspiration in a wide range of experiences, from neuroscience lectures to tales as old as time". Quite. It's apparent from the very start of opener "Dreamers" – deserving centrepiece of the EP that preceded this record's original release – that much had changed in the Savoir Adore camp since Wooded Forest. The production is altogether more thick and glossy, the guitars more processed and both Muro and Hammer's voices sound less like those of talented amateurs and more like those of confident pros primed, or at least aiming, for big radio-hit success. All this could be distracting if it wasn't for the fact that "Dreamers" is such an engaging song. Full of crisp beats, lilting electric guitar and easygoing sentiment ("you can stay where you are / keep on sleeping"). It is one of the album's best moments, right off the bat. The other best moments are similar, in that they are all laid-back, radio-ready fusions of electro and guitar pop, often with a pleasingly retro tinge. "Anywhere You Go" has a '60s girl-pop vibe, seeing Muro handle its devotional lyrics with some panache, while "Sparrow" similarly consigns Hammer to backing vocals and has fun with some tricksy romantic lines. Elsewhere, a degree of 1980s nostalgia runs through several songs that brings to mind Fleetwood Mac circa Tango in the Night. This may be as much down to family connections as to following recent trends, however – Hammer's father is none other than Jan Hammer, he of Mahavishnu Orchestra fame and the man who took the Miami Vice theme tune to the top of the Billboard Hot 100 in 1985. The other thing that links Our Nature's strongest moments, however, is that they all appear on the album's first half. The second half is dominated by upbeat efforts that feel like paler imitations of the really strong ones ("At the Same Time", "Beating Hearts") or slower ones that simply drag on (like closer "Sea of Gold"). Quite strikingly for an album with such a rich pop approach, barely any tracks run to less than four minutes, which means that for all the sticky sweetness of its excellent highs, Our Nature feels like one long low as it lurches to a conclusion at last. A little more quality control and commitment to conciseness could have made Our Nature the explosive re-affirmation of talent Savoir Adore deserve. As it is, this party feels a little burned out, with two few great memories amid the haze.